Have You Ever Heard Of A Purple Pumpkin? Well I know I haven't. (Although I was able to find the attached picture of one, I don't think it's real.) The reason I ask is I went to our local dollar store just hte other day, to buy pumpkin leaf bags for outin the yard. I picked up 3 bags without looking at the back where the clear plastic was, I just looking at the picture on the fron which showed 3 orange pumpkins. I assumed that they would all be orange, I have never seen pumpkin leaf bags that were any color but orange before. Well I got them home and it turned out that one bag of them was orange, while the other two bags of them were green and purple. What the heck is that? I have never heard of a purple pumpkin before then, have you? I really don't understand what would inspire someone at the bag making factory to make PURPLE pumpkin bags!?!?! I looked at the bag and it says "made in china" so maybe aome mylot member from China could explain this to me. I it a new trend or style thing in China? To have purple pumpkins? Have you always used purple as a pumpkin color? Or do you think that the purple pumkins ended up at the dollar store because they were an accident or something? I've never seen a purple pumpkin before it does sound bizarre, i don't know what a pumpkin bag is though is it for storing pumpkins perhaps? or decorating them? If it's just for storing the pumpkins maybe they were just trying to be different if it's for decorating them it would be different to have a purple pumpkin for Halloween I suppose. I think she is talking about the "garbage bags" that are decorated to look like a pumpkin, normally people put their lawn dtimmings or leafs in them and leave them out as decorations. Last year someone on our street did this and used leaves well it was windy and one bag didnt have many leaves in it and it was "flying" around the street. (or at least thats how it looked" it creeped a few kids out LOL. I see, well a purple one in amongst the orange will look different and add some colour to the street I suppose. Yeah I am talking about big garbage bags with jack-o-lantern faces drawn on them. Typically they are orange. Thats very odd, however I have been noticing lots of purple holloween decorations acround town this year. I think I have seen just as many pruple decorations as I have orange if not more. I dont know whats the deal with that maybe we are just way behind on the latest holloween trends LOL. Good luck with your purple pumpkins! Yeah I dunno its really wierd. Maybe it's like the time I heard some woman on TV say Green is the new Pink for babies. I guess someone thinks purple is the new orange......it still looks purple to me. Actually, I have heard of pumpkins coming in different colors, it is not uncommon. In Kentucky, your pumpkin can turn blue thanks to the atmosphere around there. The plants turn blue in Kentucky. Even some people have been known to turn blue around there. Some people think that I am joking when I am talking about this, but it has been known to happen. It is just the atmosphere that does it. That is bizarre. And very interesting. What is it in the atmosphere that causes this? Do you have a picture of anything that has turned blue that you could post here so I can see? If a person turns blue then do they get sick or is it just a pigmentation thing? Well I got them from Dollarama. They are packaged with a label that makes it appear as if they are all orange but if you turn the bags over to see the clear side, you can see in, and they actually have bags of orange, of green, and or PURPLE. I hope you find them. Thanks, I'll go to Dollarama and have a look. Hopefully I can find them! i've never heard of purple pumpkin till now.that's so cool! was that the real color?or only paint on skin? i would love to see that strange pumpkin a day! i'm in china, so maybe i should search for it! 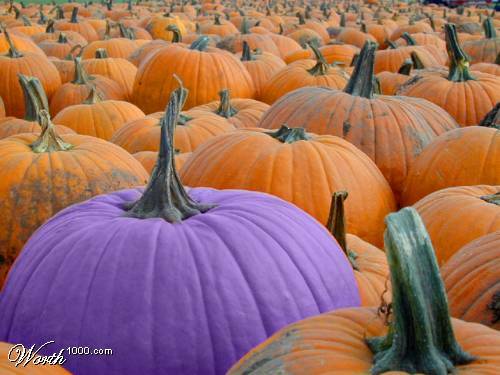 Well the picture I posted is just something I found to show how out of place a purple pumpkin looks. What i have is a big purple leaf bag with a jack-o-lantern face on it. I got it at Dollarama. The package says made in China so I thought that maybe purple pumpkins were a chinese or asian style thing. I have seen many pictures of asian girls in very couture styles of clothing so I thought maybe that was carrying out in to holiday decorations. That is one pretty cool looking pumpkin! No, I haven't ever seen one either, until now atleast! I always try that I doesn't heart to any one.